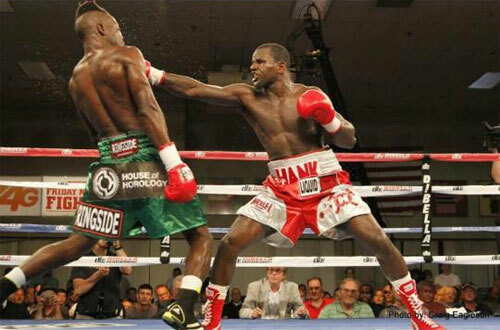 Hammerin' Hank Lundy stepped up in his nationally televised 10-rounder against #3-ranked Olusegun Ajose, on Friday night at Rockingham Park in Salem, NH. Very much at home in the spotlight of another main event on ESPN2's Friday Night Fights, Lundy out-sped, out-worked and ultimately outfought his opponent, to take a one-sided unanimous decision in a fight many thought he might lose. The switch-hitting Lundy came out left-handed against his southpaw opponent, and immediately found success. Lundy remained in the unorthodox stance all night, and banked round after round. On my scorecard, Lundy won every round of the fight. In round three, a Lundy left hand found its mark and appeared to hurt Ajose. Two rounds later in the fifth, Lundy drilled his opponent with a pair of rights that clearly stunned Ajose. Lundy kept firing, but could not knock Ajose down or out. However, this was a terrific performance by Lundy and a clear-cut win. After two consecutive decision losses, the timing of Lundy's victory couldn't have been better. All three official judges scored the fight for Lundy. Judge Frank Wells gave all ten rounds to Lundy, with his score of 100-90. Judges Mike Nolan and Leo Gersel each gave two rounds to Ajose, and tallied scores of 98-92 for Lundy. I scored the fight 100-90 for Lundy. The win over the highly ranked Ajose (32-2, 14 KOs), should push Lundy up the junior welterweight ladder, and put him in position to perhaps face world champion, and fellow Philadelphian and friend, Danny Garcia. Lundy (23-3-1, 11 KOs) is not a perfect fighter. At times he is reckless and his chin is susceptible to incoming shots. However, Hank Lundy shines in the spotlight. He is a natural fighter who appears to love the thrill of battle and is willing to take on anyone. Perhaps even more importantly, he seems unaffected by his losses in the ring. Some fighters are undone by a stumble. Not Lundy. He simply refuses to accept defeat. Some call it delusional, but it's working well for Hank. Lundy is a "must watch" fighter with a the drive to win and an equally strong drive to entertain the fans. Lundy not only handled the respected Ajose, he did it with style. Danny Garcia fights Lucas Matthysse on September 14th, in the ultimate fight at 140 pounds. It is a great match that could go either way. Of course I am a big Garcia fan, and believe he has a very good chance of beating the feared Argentine in what figures to be a tough bout. But the thought of an eventual Garcia versus Lundy fight, gives me one more reason to root like crazy for Danny to retain his titles against Matthysse. As if I needed more reasons.